It seems like we parents are forever buying toddler clothes. And if your kids are anything like mine, you'll find that your child has to merely look at the garden/her scooter/the sandpit and that lovingly laundered T-shirt is in the washing machine before you've even dressed your little treasure! This page has some tips to make your toddler's outfits go further, and what to do when you want or need to dress him a bit more smartly, or for a fancy dress party. Tip #1 Be realistic. When it comes to toddler clothes, Toddlers really do not care what they look like, however much you do. Trying to instill a sense of style in them is like trying to stop it raining by the force of your will. There is nothing wrong with wanting your child to look nice, but don't kid yourself it's for them. Tip #2 So how do you dress them nicely? The answer is to persuade them. This is in fact much easier than it might appear. For a start, kids this age are inveterate attention seekers and you can use this to your advantage. For example, lavish heaps of praise on her when she agrees to even try on the beautiful flower girl dress you have bought her. Tip #3 Choose your battles. If he is spending the afternoon playing in the garden, have some old clothes on hand that he can happily cover in mud, grass, water etc etc. Tip #4If your toddler has been invited to a fancy dress party, and completely refuses to attend, try these ideas to get him to dress up. They worked for my costume-phobic toddler at the time. Buying Toddler Clothes, Is It A Joy Or Pain? One thing you need to ask before you go out and buy any toddler clothes is - what do you want it for? While this sounds the most stupid question ever, stick with me because sometimes our parental pride makes us buy completely unsuitable toddler clothes for our kids! We all know we have to look smart for weddings. However, think carefully before you try to extend this rule too far as regards young children. So it's worth seriously questioning the need to dress your toddler in restrictive or easily torn toddler clothes. If wedding etiquette demands formal toddler clothes - whatever the age - it might be worth asking if you can change your child into something that is more child-friendly - but still smart - for the reception. I remember a really child friendly wedding with my boys, which had the usual Kids table, with party food, not a little adult meal, Kids party room, which does remove the stress of Toddlers, who are out of their comfort zone all day. But to keep the young ones at the table, the food arrived at intervals, covered by a tray. The lid was only removed when all were seated or calm, to a little fanfare. It worked for ages as they were not getting bored, as some of the trays did not contain food but surprises. I thought that was a lovely touch by the bride and groom given to parents of small Kids. ...is a place to have fun and get filthy! Well not everyday, but the point is that you should never send your toddler to daycare in clothes that you would be upset to see covered in paint and the remnants of their lunch. What Do Toddlers Actually Like? I asked some mums of toddlers if their daughters were bothered about what toddler clothes they wore. Contrary to boys (who you can put in the latest costumes from Oliver Twist and they're as happy as Larry), it seems that little girls have just as strong opinions about their clothes as the rest of us! Dresses are great - one mum I spoke to tells me that her daughter refuses to wear anything else. They have to twirl out - it's no wonder that a lot of the dresses you see look more than a little 1950's. Colour rules I asked if toddler girls were as obsessed with pink as all the shops might have us believe. The consensus was that they did like pink, but it was more important from the girls' point of view to wear colourful toddler clothes. Flower power - any flower designs are always a winner with this age group, as you can see with the popularity of dresses like this one, from Mini Boden. Should You Take Them Shopping? A definite no-no. Even at the age of 2, girls have very strong opinions about what they want to put on. Do you really want to have a battle over a frilly white dress when it's the middle of winter and she really needs something a bit warmer? Use the guidelines above, but go shopping alone. What your tot hasn't seen, she can't have a tantrum over! It's a simple as that. The thing about children under the age of five is that it's much less easy to negotiate (translation: bribe) them into behaving well than is older children. The other thing that we are much less aware of as adults is, that young children can often find formal occasions such as weddings very stressful. Their problem is that they don't know how to tell you in language you understand - they're much more likely to play up and get your attention rather than say "mommy, I'm scared". The following advice should help you prevent many of the problems happen on such important occasions, and will help both you and your toddler enjoy the occasion much more. Toddlers suits and having fun can belong in the same sentence! 1# Work out beforehand if your child is going to eat in their suit. This has two major consequences for your purchase. If your boy is going to eat in his suit, you need to be aware that he is likely to get food on it. Is this going to be a problem? If so, you need to change him before the meal - or at least take off the jacket and put a towel on his lap. 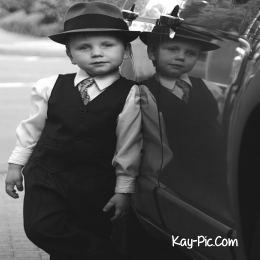 2# get your toddler used to wearing the page boy suit (for example) well before the occasion. Trying to force him into his formal wear on the day of the wedding (or whatever occasion it is) is a recipe for disaster. Negotiating tactics such as "be a good boy and you can have… when we get home" are generally ineffective with this age group. This is because at this stage they don't really have a grasp of abstract concepts like getting a reward later. Toddlers are all about instant gratification, as I'm sure you'll agree! Instead, what you need to do is to make wearing the toddler suit as normal as possible by encouraging him to wear it at home as often as possible. Even better if there are other boys and men who can where theirs as well. If you turn it into a fun dressing up game, your chances of getting your child to wear the suit on the occasion are much higher. 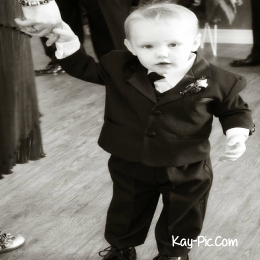 3# If you're buying a formal toddler suit, the chances are you're going to be attending a special occasion. The fact that everything is more formal, more special will increase your stress levels if anything doesn't go to plan with your toddler. Because things not going to plan are a speciality of most under fives, you're going to need to make a list of potential hazards and what you'll do to deal with them. If you're a guest at a formal occasion, it might be worth talking to your hosts about any potential problems. They will appreciate the fact that you've taken the time to ask their opinion. Wearing a toddler suit is part of this challenge, and don't be surprised if there's some resistance to it. Go easy on your boy - it's natural for him to resist the new. Patience and humour are the key to coping with this.